Licht draaiend en absolut spelingvrij! Optional permanent or releasable installation. Precision-made metal ball-link for slopfree linkage to any heavily stressed control surface. 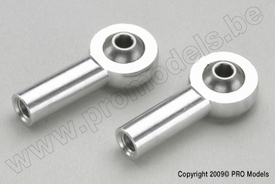 Metal M2,5 ball link, 2 pcs.